MONTREAL – Montreal Canadiens general manager Marc Bergevin announced on Sunday that the team has agreed to terms on a three-year, two-way contract (2016-17 to 2018-19) with forward Artturi Lehkonen. “We are very pleased to have reached an agreement with Artturi Lehkonen. Artturi is a young forward who enjoyed success at a very young age playing in a highly competitive league in Sweden. He has shown a remarkable attitude since we selected him in the 2013 NHL Entry Draft. Over the past few years, his progression has been excellent, and he has gained valuable experience. We are proud to see him make the jump to another level, and we look forward to seeing him compete for a spot with our team at training camp in September,” said Bergevin. Lehkonen, 20, played 49 games with HC Frolunda in the Swedish Elite League in 2015-16, recording 33 points (16 goals, 17 assists). The 6’ and 174 lbs winger displayed a plus-6 differential and served 12 penalty minutes. In the playoffs, Lehkonen led the league in goals and registered 19 points in 16 games (11 goals, 8 assists), helping his team win the Swedish league championship. He also broke a team record for playoff points (19), a record set by Daniel Alfredsson in 2005. In two seasons with HC Frolunda, the Piikkio, Finland native registered 49 points in 86 games (24 goals, 25 assists). 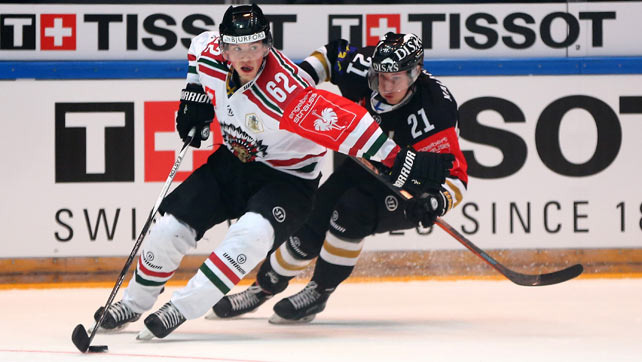 Lehkonen began his professional career in the Finnish Elite League at only 16 years of age. During the 2011-12 season, he also played for the TPS Turku junior team, leading his team in scoring with 54 points in 40 games (28 goals, 26 assists). He was also named the SM-liiga Rookie of the Year in 2012-13. At the international level, Lehkonen was selected to the Finnish national team on three occasions for the World Junior Championships (team captain in 2015, gold medal in 2014, bronze medal in 2013), as well as twice for the U18 World Championships, where he led the tournament in goals (7) and points (10) in 2012. Selected in the second round, 55th overall in the 2013 NHL Entry Draft, Lehkonen took part in the Canadiens’ Development Camp every summer since being drafted by the organization (2013, 2014 and 2015).